The Whooping Crane Eastern Partnership (WCEP), of which the International Crane Foundation (ICF) is a founding member, presently operates two projects to restore a migratory Whooping Crane population in the eastern USA. The Ultralight-led Migration Project that began in 2001 utilizes eggs from captive breeding centers that are hatched at the Patuxent Wildlife Research Center in Maryland. The young cranes are later transferred to Wisconsin and trained to follow ultralight craft. After making their first migration to St. Marks National Wildlife Refuge on Florida's west coast, they find their way back to Wisconsin alone and continue to migrate back and forth unassisted. 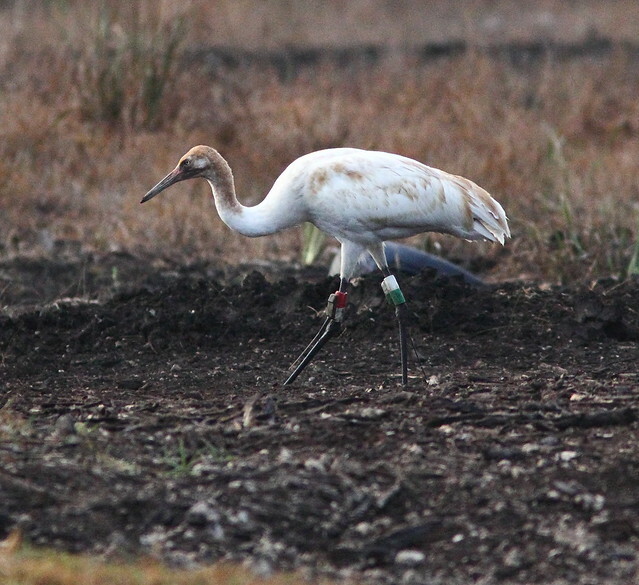 As time for fall migration approached, eleven juvenile cranes in the 2012 cohort of captive-raised Whooping Cranes were released to the wild. Five followed an ultralight craft. The other six were part of the DAR program and were permitted to find their way south without assistance. Among them was a female Crane Number 13 who was given the name of Tussock. The five juveniles led by the ultralight arrived at the St. Marks National Wildlife Refuge in Wakulla County, Florida, on 23 November. The six free-flying DAR cranes, numbered 12 through 17, are identified by the arrangement of colored bands and transmitters on their left and right legs respectively. Five of the six, including Tussock, migrated south in record time. According to WCEP, they departed from the Horicon National Wildlife Refuge in Wisconsin on 31 October. Satellite information indicated roost locations in Lawrence County, Indiana, on 31 October, then in Chester County, South Carolina, on 2 and 3 November where all five were also visually confirmed. Next they were located at Cape Romain National Wildlife Refuge, Charleston County, South Carolina, on 4 November, and in Glynn County, Georgia on 5 November. Remarkably, they had flown about 1200 miles unassisted, from Wisconsin to Clay County, Florida in only six days, arriving by 6 November. They moved to Manatee County, Florida, on 7 November and into Everglades National Park, Monroe County, Florida, on 8 November and back northward into Hendry County, Florida, on 9 November. Crane #13 had been fitted with both a satellite transmitter and a second short-range transmitter. She and a juvenile male #15 named Cypress seemed more adventurous and satellites then tracked their flight another 70 miles southeast to the birding patch adjacent to our home in Broward County in South Florida, where they arrived around 22 December, 2012. We learned all the above details only after our fateful encounter, which began on Saturday, January 5, 2013. My friend and neighbor Scott, who regularly walks in our local South Florida birding patch, Tweeted me with a photo of a white crane taken by his daughter, at the northern end of the patch. 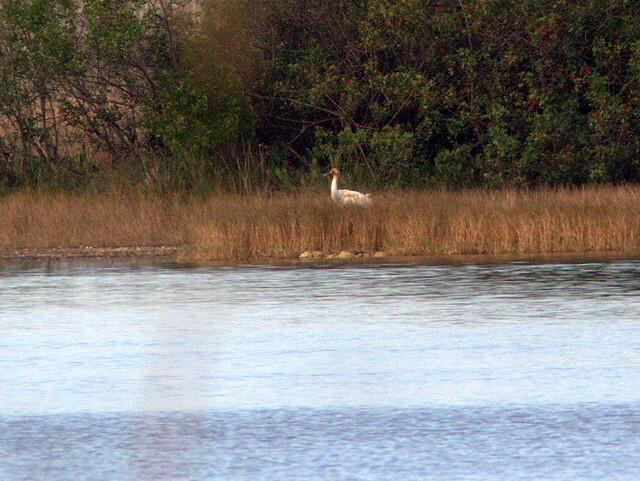 I was surprised to see that it was a juvenile Whooping Crane. 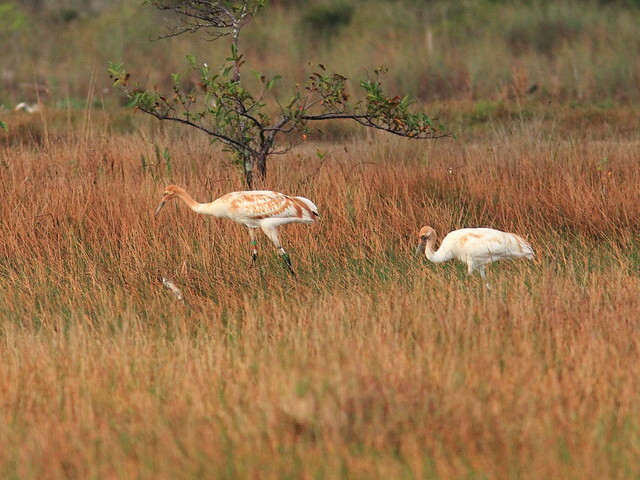 The eBird data base contains no historical records of Whooping Crane sightings in either Broward County or Miami-Dade. (Photo © 2013 Scott McPherran, used with permission). The bird was adjacent to a wetland where groups of off-road vehicle drivers assemble on weekend nights and conduct races. 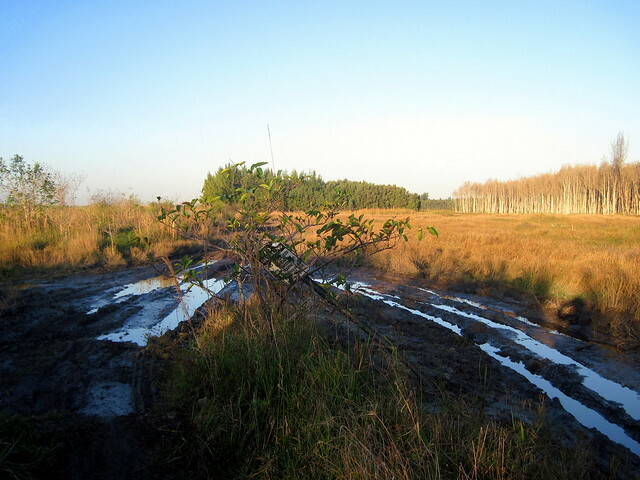 They often drive into the posted wetlands and routinely remove the "No Trespassing" signs. The bird seemed very tame and permitted close approach. 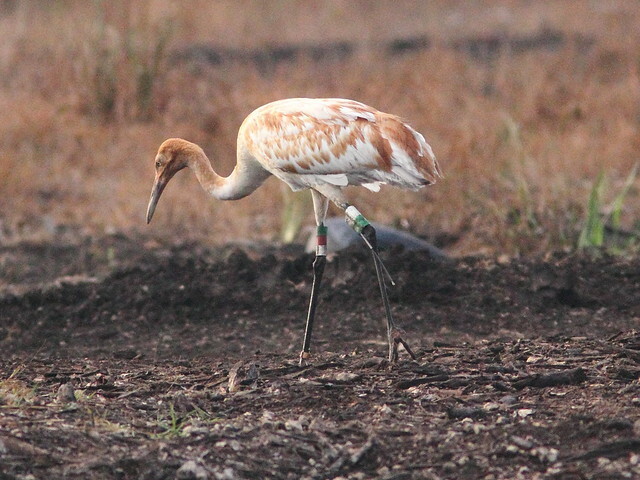 This concerned me and since I had obligations that kept me from going out into the patch, I posted the sighting on the Tropical Audubon Society Bird Board with a request that someone come out to monitor and help protect the crane. 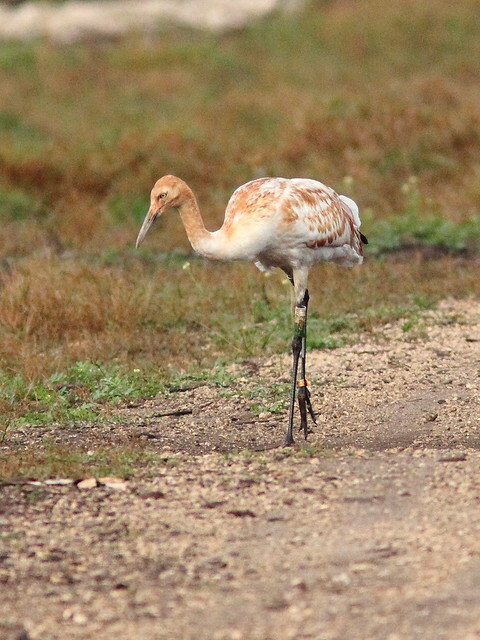 Several birders responded, and when they arrived at the site some of the off-road vehicle riders told them that they had been seeing two of the cranes in the area just north of our patch since December 22. They also said that the birds were very tame and permitted them to drive close by them. 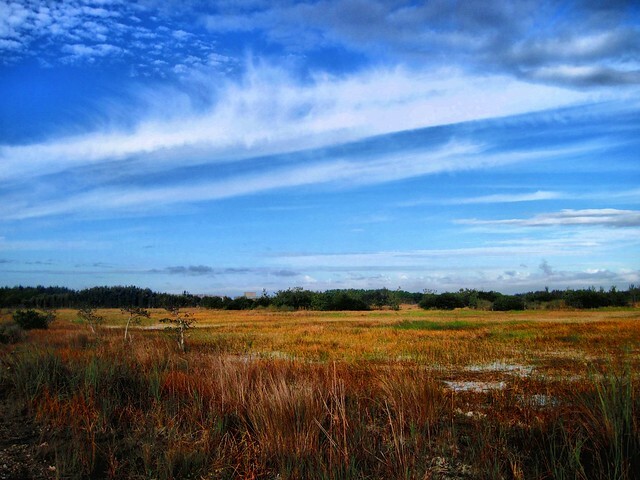 The cranes initially occupied the northern City of Pembroke Pines section of the West Broward Water Conservation Area. 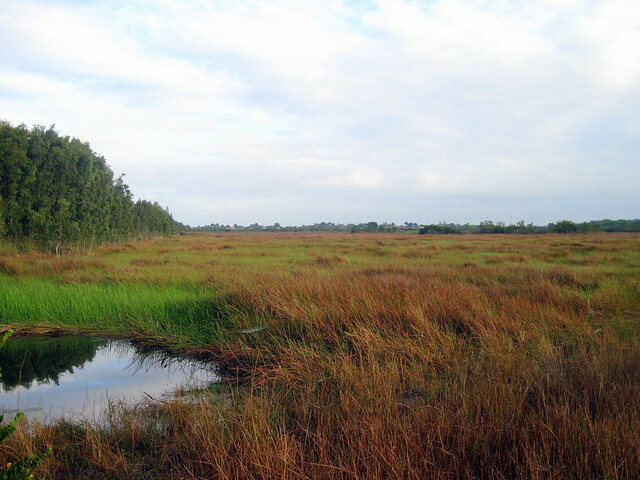 Here the wetlands are well maintained and patrolled. During the summer of 2005 this exact spot had attracted a flock of over a dozen Greater Flamingos that presumably moved up from Snake Bight in the southern tip of Florida during the sustained southerly winds accompanying Hurricane Dennis. Below is one of the "alligator holes" in the undisturbed portion of the wetlands. 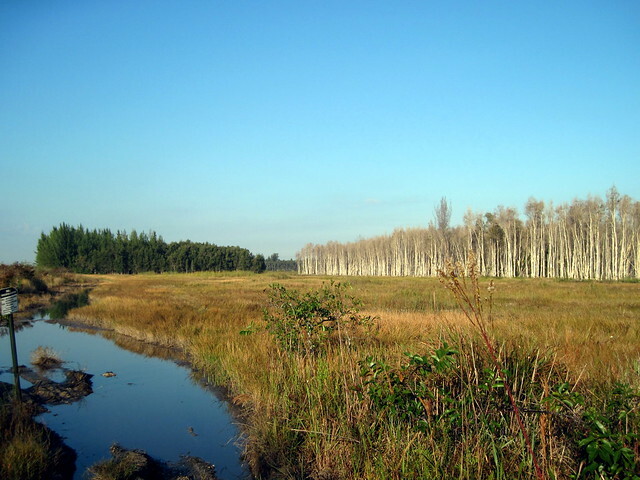 The trees to the left are mostly closely-spaced Melaleuca. The next morning we got out before sunrise and walked about a mile and a half, all the way north out of Miramar into Pembroke Pines. After taking a few steps across the city limits I sighted two white dots in a wet prairie about a half mile away. We had to detour along a city street to avoid entering private land, but sure enough, we found the two Whooping Cranes. The other is Crane # 13, a female named Tussock. Her band color pattern from top to bottom: left leg has a Red/White transmitter with antenna, and right leg has a White/Green transmitter with antenna. The second transmitter permits satellite tracking. I hoped to personally document their presence in the Miramar section of our patch, so on Monday, January 7th I got out before sunrise and walked northward the entire length of the patch. No cranes! I hiked an additional three miles along several paths that border the wetlands and lake. On January 7th the female showed signs of injury to her right leg. She limped or hopped to avoid putting weight on it. Photo of injured crane taken January 7 by Barry Heimlich © 2013, used with permission. On January 25th the female was found in a residential neighborhood acting listless and mostly sitting down. The next day she had to be captured and was transported to Disney World Animal Kingdom in Orlando, where she is being treated and rehabilitated for injury to her right foot, which was extremely swollen and most of the middle toe was dead. The injuries may have been caused by entanglement of some kind. She was reported to be doing well and if healing progresses she may soon be released back to the wild. As of this writing, I have seen the male crane in our neighborhood almost every day. He divides his time between foraging in more remote areas of the wetland and forays into residential subdivisions. I took this photo on January 31 as he flew overhead towards an adjacent housing development. 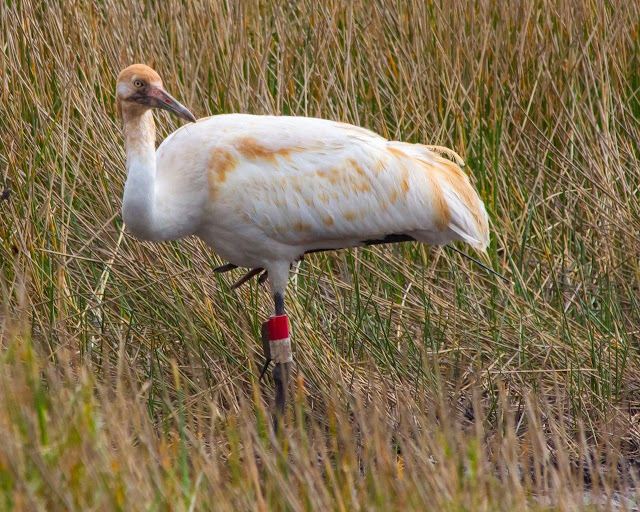 By the way, Whooping Cranes in this population are not "countable" for listing purposes as officially established in the American Birding Association (ABA) area. Of course, I like to watch pre-season exhibition football, basketball and baseball, and I enjoy the games even though they don't "count." Just fascinating. We have that same problem with ATVs....I'm sure everyone does. Great post on the cranes, Ken! Your photos are beautiful! Thrilling account, Ken. It's worrisome that they are so tame. Makes the male still out there easy prey. Please keep us updated. 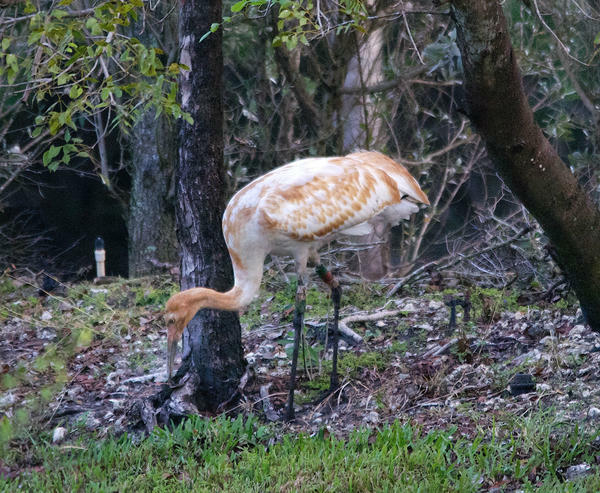 This is a wonderful account of our encounters with the infamous Whooping Cranes of western Broward County. Thanks< Ken. Fabulous post! I missed them when I visited recently, but you scored big. This is the only part of "Disney" I want to see. How lucky to have them come visit you! Great post and photos Ken. UPDATE: The remaining male crane remains in our neighborhood, spending most of his time on the shore of a lake in the Harbour Lakes subdivision. Ironically, its favored location is right in front of Scott's home. 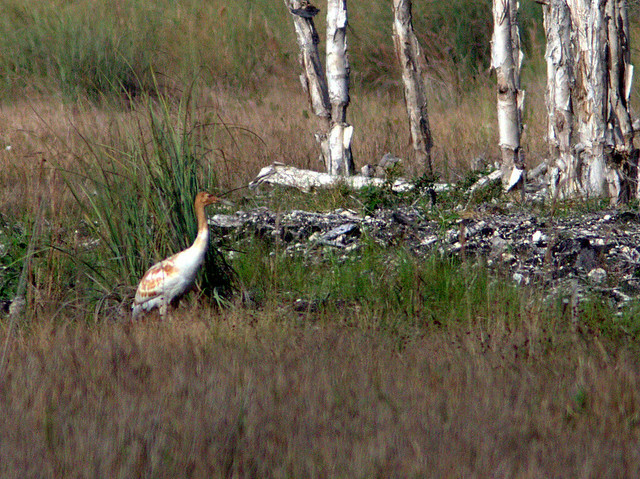 Scott's photo was the first to document its presence in the adjacent wetlands. The injured crane is recovering at Disney Animal Kingdom. The veterinarians reported there was still some swelling at the site of her amputated toe. She has regained 8% of her body weight over the first 5 days in rehabilitation, and will probably be released within a week. A decision must be made as to whether she should be reunited with the male in the urbanized area or placed with the others from the DAR group in Hendry County or at St Mark's NWR. 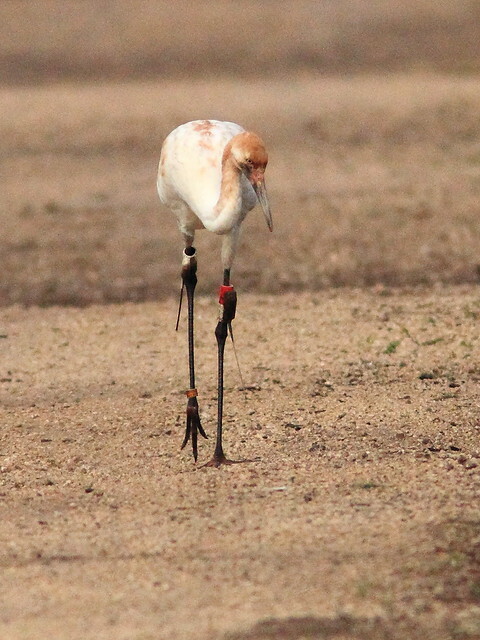 Wonderful detailed story of the Whooping Cranes that appeared so surprisingly in our area, Ken. Thanks for the great images and information! It has been so rewarding to have been part of this amazing experience. My encounters with these magnificent birds are something I will never forget, and learning the history and effort involved in saving them is truly inspirational. Eva and the many others involved in this exceptional project are very special people. I would love to see Tussock reunited with Cypress if her injury heals such that she can be re-released. At the same time, I trust that WCEP will make the best decision concerning her future. Very nice report! Thanks for sharing. I've been following these birds as they are near where my parents live in Wisconsin. Glad this one had a happier ending. I hope these birds really do make a comeback in our lifetimes. It was nice to meet you on Jan 7. Glad you got the photos. Hope your son (son-in-law?) is doing well. The crane is now spending its nights in a secluded spot in the wetlands, and returns to the same residential lawn each morning. I have more photos on my FLICKR pages. @Brian-- Thank you-- While I was birding with you on January 7 it was our daughter who broke her ankle. Her husband had broken both legs in early November. We flew to Illinois later that day to help with the children and household. He is finally able to drive and use a walker. Our daughter cannot bear weight until the end of February, so we will be going back to Illinois to help out. Say good bye to that area they are building roads, and want to build out the area.